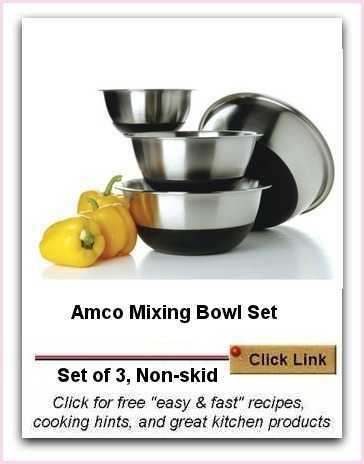 This Amco Mixing Bowl set is ideal as a starter set for novice cooks. It is durable, high quality and importantly has a non-slip base. The three Amco stainless steel mixing bowls have non-skid silicone bottoms that provide a firm grip during use. This is an improvement from traditional mixing bowls that I would have to place on a wet towel on the kitchen bench, for some grip to prevent movement and potential spills when mixing and stirring ingredients. The wide rim of the mixing bowl by Amco makes it easy to hold and transport. As you can see, the three bowls nest for convenient storage. My own mixing bowls have been in use for decades and I too have them in various sizes. Remember, I am keen on cooking quickly and efficiently, so all my equipment has to work hard and I recommend you do not waste time with poor quality or sub-standard equipment. A good mixing bowl, like this from Amco, has to be heavy enough to sit firmly while combining ingredients vigorously. I would never use a lightweight bowl or one made from plastic - they are too lightweight. Be sure it has a wide mouth with a non-spill rim. All these little things which ensure quick processing or reduce the likelihood of spills, will save time in the kitchen. You needn't purchase a whole lot of kitchen gear, but the basic equipment should ideally be quality items.